Lenglen won her third Wimbledon, the French Closed and the World Hard Court Championships (both played in Paris). At Wimbledon Lenglen defeated Ryan 62 60 in the final challenge round at Wimbledon. At the World Hard Courts she defeated Mallory in the final. But the major event of the year was the second round match at the US Championships between Lenglen and Mallory. There was no seeding at the Championships so after receiving a first round walkover Lenglen met Mallory after little time in the US and little practice. Mallory won the first set 6-2 and was 10 and 30-0 up in the second when Lenglen started to weep and withdrew due to illness. 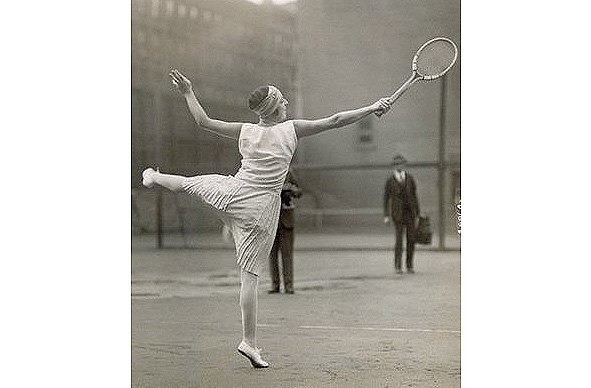 Mallory dominated the USA grass court season, winning 6 tournaments including the US Championships, but another player burst on the scene who would dominant after Lenglen turned professional, her name Helen Wills. Lenglen wins 8 singles events on the Riviera. Half of her 34 singles matches were 6-0 6-0. She lost 29 games in all! Wallis Myers produced his first women's rankings for the 1921 season. 07 Irene Peacock South Africa. Entered 15 tournaments in total. Won 11 of 13 events. Defaults in 1 event and loses (retirement) to Molla Mallory at US Nationals. 39-1 match record, with 1 default. Drops only match from 1919 to 1926. Won 9 of 9 events entered. 7 events won with Elizabeth Ryan as partner. Won 9 of 13 events entered. Last edited by Rollo; Nov 4th, 2017 at 02:31 AM. Last edited by Rollo; Feb 15th, 2015 at 02:04 AM. SF: Blanche Colston d. Madeline O’Neill ???? Suzanne won all four of her singles matches without losing a game. Last edited by Rollo; May 7th, 2016 at 01:04 AM. Fischer's first name was Francis, but he preferred to be called by his initials of F.M.B. or Frank. 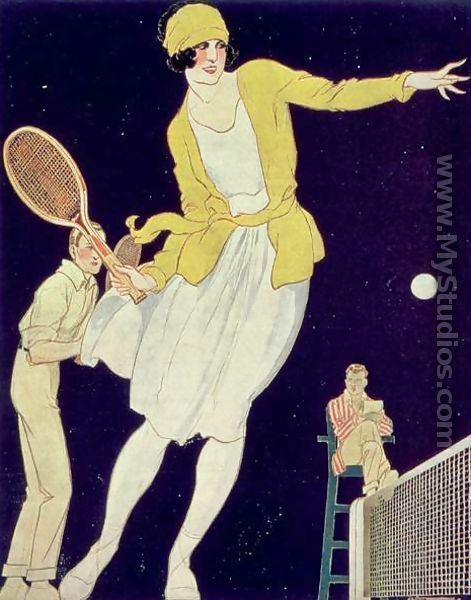 An illustration from La Vie au Grand Air in 1921, doubtless inspired by Suzanne Lenglen. The clothing is loose fitting, but stockings are still required wear. Last edited by Rollo; May 7th, 2016 at 12:31 AM. Last edited by Rollo; May 7th, 2016 at 01:05 AM. Last edited by DavidK; Mar 8th, 2012 at 12:48 PM. Last edited by Rollo; May 7th, 2016 at 12:29 AM. Last edited by Rollo; Jan 20th, 2017 at 02:28 PM. FI: Elsebeth Brehm d. ???? DF: Vera Forum/Jutta Steenberg d. ???? MX: Agneta Goldschmidt/Charles Wennergren (Swe) d. ???? Last edited by Rollo; Feb 15th, 2015 at 01:25 PM. Suzanne Lenglen did not play in the singles event at this tournament. ---Of course we thought we should not get a single game and determined just to hit hard and try not to look foolish or nervous. ...The audience were most sympathetic and clapped and urged us on. Mrs Lambert Chambers was very nice and kind to us, but I don't think she liked it as Mlle Lenglen was looking on mockingly. Last edited by Rollo; Feb 15th, 2015 at 01:31 PM. Last edited by Rollo; May 13th, 2015 at 11:05 PM. 1R: R. F. Maisel d Rosalie Evans w.o. 1R: Nora Meyer Schmitz ad. Mrs. M. D. Straffin w.o. 2R: Madeline Westervelt d. Mrs. Monal-Lesser w.o. 2R: Rene Christy d. Florence Havemeyer w.o. 3R: Strauss d. Thompson w.o. 2R: Dorothy Shephard d. ???? Wallis Myers was suddenly recalled to London and could not play the mixed final. Suzanne withdrew from the singles after the draw was made. Last edited by Rollo; May 7th, 2016 at 12:27 AM. 1R: Ann Sheafe Cole d. Mrs. John Fallon w.o. 1R: M. R. Lincoln d. Margaret Cooke w.o. 1R: C. Burgess d. Mrs. Burnham Dell w.o. 1R: R. Newton ad. N. Winslow w.o. 1R: Mrs. F. H. Godfrey / Ann Sheafe Cole d. Russell / Mrs. C. H. Howell w.o. 1R: Morris Duane / Martha Bayard d. M. Bradlee / Mrs. D. C. Mills w.o. 1R: John S. Nicholl / Florence Ballin bye? 1R: A. N. Reggio / Edith Sigourney d. Robert Mark / Ruth Yerxa w.o. 2R: Phyllis Radcliffe d. ???? Last edited by Rollo; Dec 30th, 2017 at 12:38 PM. Lenglen planned on entering mixed with Lord Rocksavage but he became ill. They withdrew before the draw was made. Last edited by Rollo; Dec 30th, 2017 at 12:35 PM. 2R: Doris Craddock d. ???? 2R: Phyllis Satterthwaite d. ???? 2R: Mrs L Dermer d. ???? Venue: Dulwich Hard Courts (once known as Dulwich Farm). Last edited by Rollo; Dec 30th, 2017 at 12:39 PM. Today 12:00 PM by Michael!